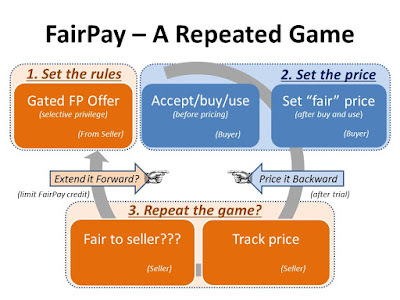 The FairPay Zone: "Subscription-First" ...Why Not Subscriber-First??? 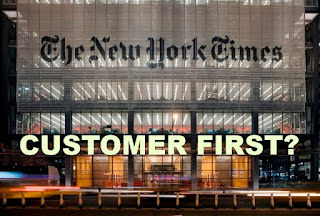 "We are, in the simplest terms, a subscription-first business," said The New York Times in its 2020 Report -- an admirable examination and re-dedication to its premier journalism. But what is missing in this picture? 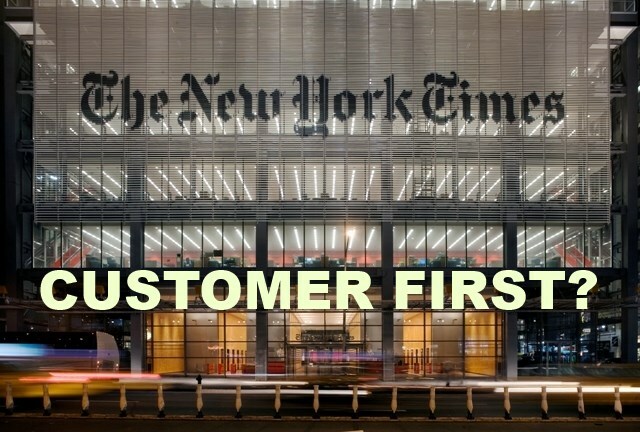 In an age where businesses of all kinds are realizing that their path to success is to go beyond "customer-centric" to become "customer first," is the Times thinking about becoming "subscriber first?" What they refer to as subscription-first is recognition that the subscriber (not the advertiser) is the customer they must center on. But are they pushing beyond subscription-centric to subscriber-first? Perhaps to some extent, but I have suggested to the Times (and their competitors) that the business of journalism must focus more directly on how business model innovation can facilitate that. A nice explanation of this difference is in a recent report from MarketingSherpa: "to come alongside customers and help them achieve their goals versus only driving them towards business goals." Customer-centric marketing puts the customers at the center of marketing; all promotions and messaging flow towards them in the way that is most relevant to them. Marketers put themselves in the customers’ shoes to sell to them better. Customer-first marketing uses the customers’ goals as the compass to make decisions about marketing approach. They put the long-term interest of the customer above the short-term company conversion goals. Marketers put themselves in the customers’ shoes to serve them better, thus building a long-term, sustainable competitive advantage. It does not appear that the Times has this deeper shift in mind. This may seem a fine distinction, but it can be made operationally important. FairPay is a new strategy for subscriptions that are truly subscriber-first at the core. It focuses all aspects of the business on value as each subscriber perceives it, and does that in the most direct way possible -- by involving the subscriber in setting their subscription price. We are, in the simplest terms, a subscription-first business. Our focus on subscribers sets us apart in crucial ways from many other media organizations. We are not trying to maximize clicks and sell low-margin advertising against them. We are not trying to win a pageviews arms race. We believe that the more sound business strategy for The Times is to provide journalism so strong that several million people around the world are willing to pay for it. 3. We need to redefine success. The newsroom has embraced data and analytics over the past year, with positive effects. We now have a better sense for which of our work resonates with readers and which does not. We’re producing more resonant work, and we have largely resisted the lures of clickbait. Now we need to take the next steps. The newsroom needs a clearer understanding that pageviews, while a meaningful yardstick, do not equal success. To repeat, The Times is a subscription-first business; it is not trying to maximize pageviews. The most successful and valuable stories are often not those that receive the largest number of pageviews, despite widespread newsroom assumptions. A story that receives 100,000 or 200,000 pageviews and makes readers feel as if they’re getting reporting and insight that they can’t find anywhere else is more valuable to The Times than a fun piece that goes viral and yet woos few if any new subscribers. Yet the newsroom should also understand that no metric is perfect. To a significant extent, we will need to rely on a mix of quantitative measures and qualitative judgments when deciding which stories to do and to promote. Achieving the right balance is tricky. We neither want to equate audience size with journalistic value nor do we want to return to the days when we persuaded ourselves that a piece of journalism was valuable for the mere reason that it appeared in The New York Times. The Times seems focused on the value of its reporting to subscribers, but it is not clear that this looks beyond their own objective of "attracting and retaining subscribers." A true customer-first strategy would focus the Times on understanding the value they provide to each subscriber, in terms of that subscriber's goals, and using that to drive decisions. There may be limits to the extent to which this guides editorial, but it should guide product development, business, and marketing decisions. 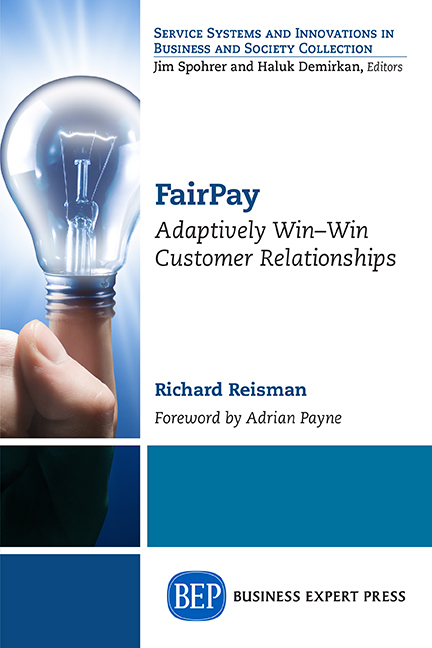 FairPay is a strategy for subscriber-first pricing that can drive all other aspects of the business. The Times is already moving in the right general direction. They can follow their subscription-first path and seek to maximize revenue by just getting smarter about their goal of getting people to subscribe and stay subscribers. They refer to "more sophisticated metrics." A nice summary of methods they may apply is in David Skok's recent NiemanLab prediction: What Lies Beyond Paywalls (see my comments on that: What Lies Beyond Paywalls -- A Better Way). The problem is that this is still aimed at the publisher's goals, not the reader's -- trying to psych out the reader, to understand how to better align prices they impose with the value the reader perceives, to get and keep more subscribers. But the reader has unique access to their personal perception of value (as it relates to their goals). Current processes do not involve the reader in real dialog that can expose those perceptions (or their goals) directly -- and signal that the publisher cares about them. A truly customer-first, subscriber-first strategy would involve the subscriber in measuring value -- from their personal perspective. The FairPay strategy suggests a way to do this (at least for a segment of cooperative subscribers) is to involve the subscriber in setting the price of the subscription, and letting that price vary over time. Only by doing that can the price truly correspond to value -- as it varies from subscriber to subscriber and from period to period. The single price set by the Times ($2.75/week) is too much for many potential subscribers, and too little for many dedicated ones. Too much for a given subscriber in some periods, and too little in other periods. 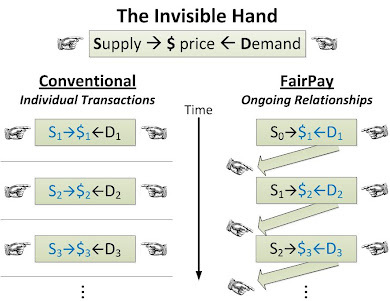 The FairPay strategy can involve the subscriber in a cooperative and dynamically adaptive process that can quantify the value that subscriber sees (as it relates to their goals), and set the price accordingly. It seeks to do this in a way that is simple, yet balanced to work for both the publisher and the subscriber. It applies dialogs about value to elicit value perception data from the subscriber that can be obtained in no other way. These dialogs also serve to deepen the relationship by demonstrating that the subscriber's perspectives and goals are respected. At the same time, this process gives the publisher a way to validate that information, to nudge the subscriber to pay fairly, and to cut off FairPay privileges for those who are uncooperative. This operates as a repeated game, a structure that can motivate cooperation. Think of it as not just customer experience (CX), but a truly customer-first focus on value experience (VX). This may not work for all subscribers, at least not right away, but it can be applied to select segments of current and future subscribers to get and retain more subscribers, and thus increase the total value of digital subscriptions to both the publisher and the subscribers. A fuller explanation is in my post, Patron-izing Journalism -- Beyond Paywalls, Meters, and Membership. Suggestions on how this can begin with select segments and then gradually expand are in Finding Good and Fair Customers -- Where Are the Sweet Spots? The Times (and others) can try basic forms of this strategy in limited, low-risk tests, and learn to refine and extend it. They and their subscribers can learn how to cooperate to get the best and most valuable journalism possible, by the measures that matter -- the satisfaction of each subscriber as well as the profit. They can move from subscription first to subscriber-first. As the MarketingSherpa report shows, this can lead to "customer loyalty, an increase in share of wallet, and sustainable business success." Patron-izing Journalism -- Beyond Paywalls, Meters, and Membership – A summary of how FairPay can make journalism sustainable. What Lies Beyond Paywalls -- A Better Way -- My comments on Skok's NiemanLab predictions for 2017.